I ate this for breakfast yesterday morning, had it again for lunch… and can just about guarantee that I’ll be enjoying it again today. It’s just that good. Now I know what you’re thinking, ‘dairy-free butter chicken? It has to taste off.’ It doesn’t. I had my fair share of authentic butter chicken while I was in India earlier this year. It had dairy, was loaded with oil and tasted fantastic. My twist on this classic North Indian dish has that same rich taste even with just one tablespoon of oil and a half cup of coconut milk. The flavors are balanced like the real thing, it’s still hearty like the real thing, but it’s better for you and wont make you feel like you just ingested a cup of vegetable oil. I made this healthy butter chicken recipe dairy-free by replacing the yogurt with coconut milk and adding lemon juice to give it that same tang of fresh, homemade yogurt. If you’re sensitive to dairy due to it’s lactose content, you may also want to play around with yogurt made from goat’s milk. As I mentioned last week in my list of the benefits of goat dairy, it has less lactose meaning that many people who believe they have to cut out dairy completely can be perfectly a-okay with goat milk products. Okay, let’s get this Indian feast underway! PS: If you’re doing the grain-free thing like me, try serving your butter chicken over top steamed veggies (I had my lunch portion with steamed broccoli, Brussels sprouts and cauliflower). Alternatively, you could have it with some zucchini noodles, kelp noodles or bean sprouts. 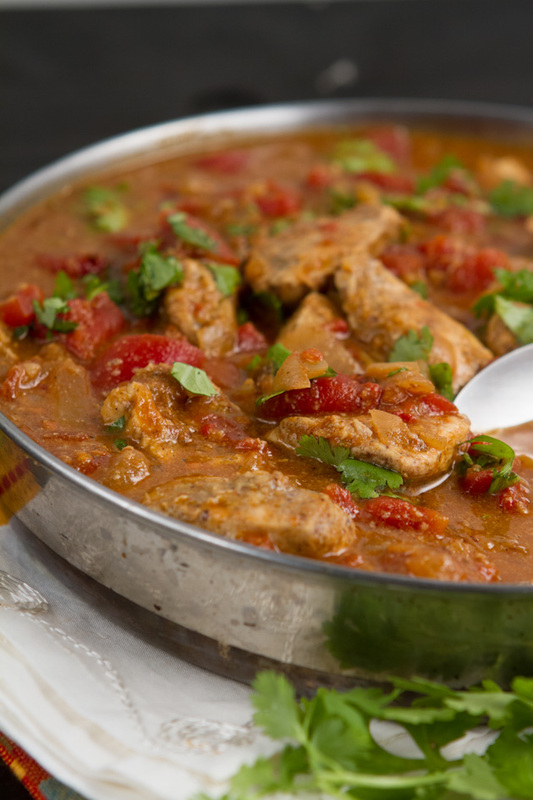 Healthy butter chicken recipe made with chicken breast, a touch of olive oil and coconut milk. 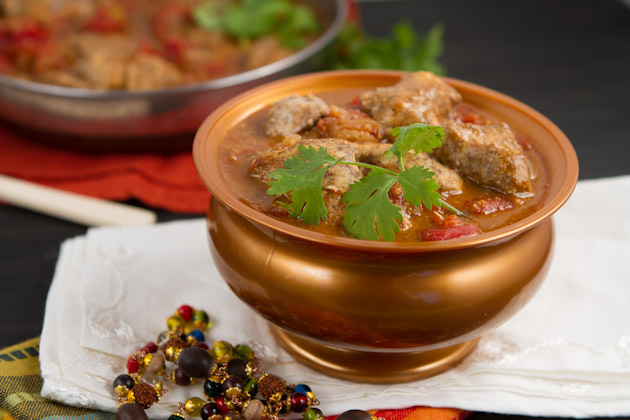 You get all the amazing butter chicken flavor with less unnecessary fats and animal products. Place cubed chicken in a glass container. Set aside. Combine marinade in a small bowl. Stir to combine and pour over top of the chicken. Mix with a spoon, seal with a lid, and marinate in the fridge for 8-24 hours. 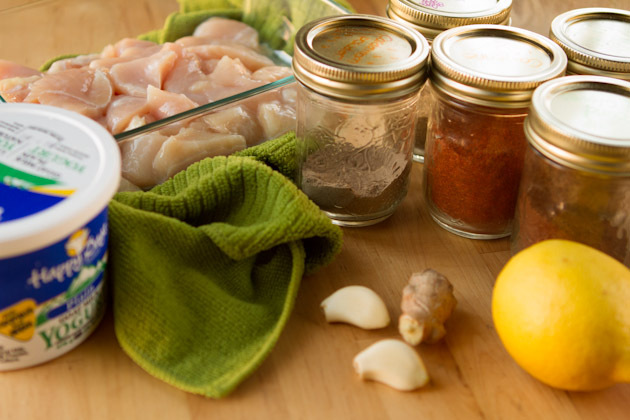 The longer you marinade the better but do not exceed 48 hours. The next day, preheat oven to 375F and line a baking sheet with parchment paper or a silicon baking mat. 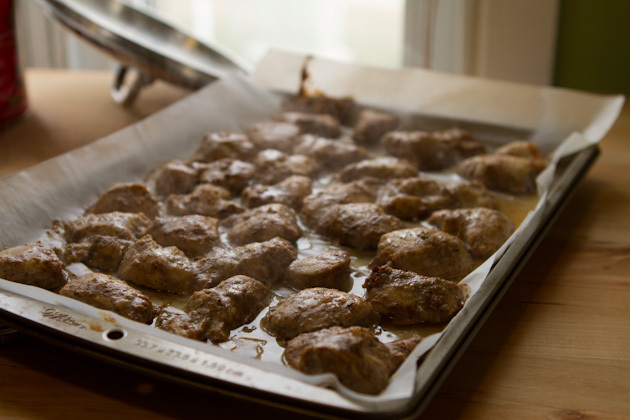 Place marinated chicken on sheet, spreading out so that they cook evenly. Bake in the preheated oven for 15-17 minutes, until internal temperature reaches 170F. Remove from the oven and allow to sit. Meanwhile, prepare butter chicken gravy by sautéing the oil, onion and garlic in a medium-sized saucepan over medium-high heat for 10 minutes until onion is brown. Add ginger, garam masala, cumin, chili powder and bay leaf. Cook for 1 minute. Add diced tomatoes, chicken bouillon cube, water, coconut milk, lemon juice, coconut sugar, salt, and pepper. Cover and bring to a boil. Reduce heat and simmer for 15 minutes. 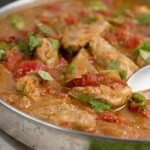 Add cooked chicken, cilantro and almond flour (to thicken), remove bay leaf, and serve. If you're sensitive to dairy due to the lactose content, consider trying goat's milk. It's lower in lactose and has been shown to be less reactant than cow's milk in those with lactose sensitivities. 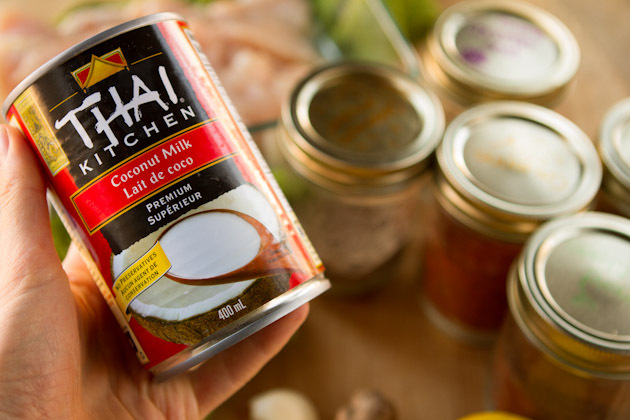 All you have to do is replace the coconut milk in the recipe above with an equal amount of goat milk yogurt. As I mentioned above, you can choose to use goat yogurt or coconut milk. I made two batch, one with each. It wasn’t until after I edited all of the pictures that I realized I took a picture of an unopened can of full-fat coconut milk. Oops! You could use that too for a richer taste, but I used the leftovers from a can of lite coconut milk. Once your marinade is complete, pour it over the chicken, put a lid on it, and allow it to marinade for at least 24 hours. After marinading, cook it, then let the completed pieces sit in their own juices. The chicken will be so moist and delicious if you let it sit while you’re preparing the gravy! The chicken bouillon I used in this recipe is from Harvest Sun. It’s gluten-free, free of active yeast and corn. 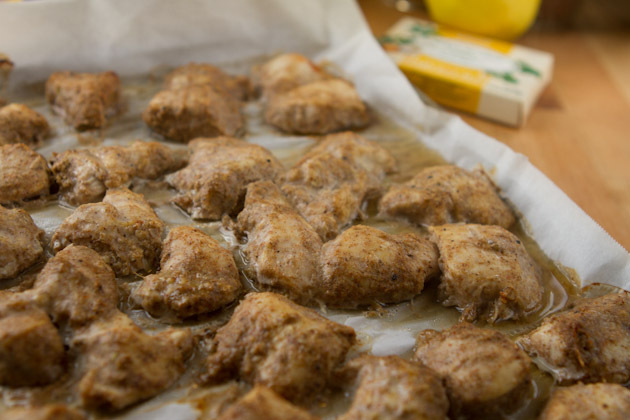 If you have a nut allergy, you can omit the almond flour or try to thicken the gravy with a bit of arrowroot starch (1-2 teaspoons) mixed with 2 tablespoons of the heated gravy. Sauté the onions and garlic until browned, add the spices. Add diced tomatoes, chicken bouillon cube, water, yogurt, lemon juice, coconut sugar, salt, and pepper. Cover and bring to a boil. Reduce heat and simmer for 15 minutes. Stir in the remaining ingredients and cook until just heated through. 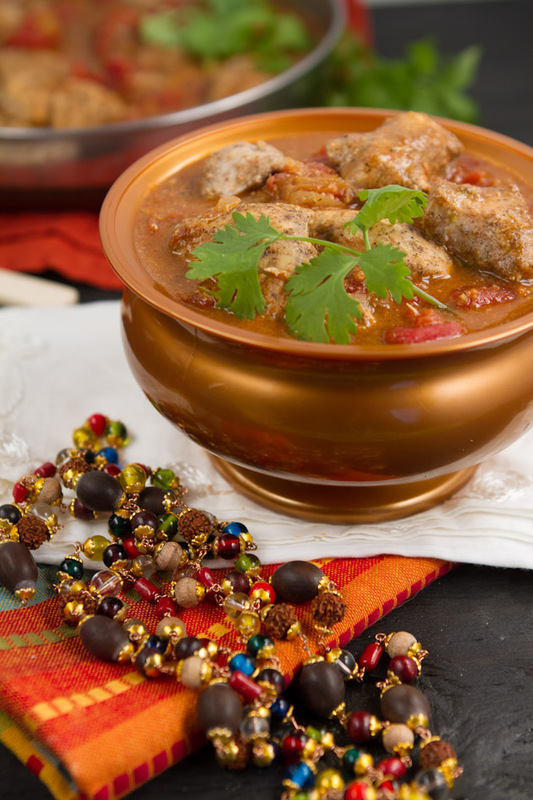 And treat your belly to this delicious bowl of curry!